The Canon IR-1024IF is a monochrome printer, copier and fax machine plus colour scanner. This multifunction unit delivers 1200 dpi print resolution and 300 dpi scan resolution. 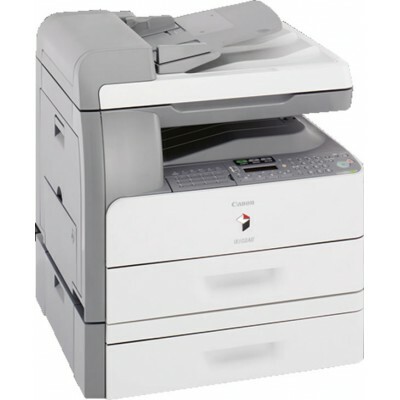 The Canon IR-1024IF copier is favoured by offices for its small size and its low running costs. The IR1024IF mono laser printer comes with built-in Ethernet, ADF, and duplexer plus offers handy features from security to direct-send to email. Print speed can use a bit of work. When upgraded with optional paper trays, the Canon IR-1024IF laser multifunction printer can handle 1,100 sheets. The control panel for the Canon IR 1024IF black and white desktop copier is well laid out, with a numeric keypad and function buttons. Print and copy speed is 24 ppm and cpm. Ethernet and USB ports are available on the Canon IR-1024IF office black and white printer. This device uses a black Canon IR-1024IF laser toner which lasts for up to 8,400 pages. The Canon IR-1024IF copier is very easy to use and operate. It is compatible with Macintosh and Windows operating systems and comes with built-in Ethernet for easy networking. The IR 1024IF laser copier can help lower running costs and reduce waste in the office as it has energy save mode, automatic document feeder, and automatic duplexer. Users can expect good quality texts and images from the reliable Canon IR-1024IF laser printer. Some of the helpful features of the Canon IR1024IF printer include a password-protected control and scan-and-send to email functionality. The IR1024IF multifunction copier does not offer Wi-Fi. Paper handling capacity is limited and the print speed is a bit slow.